Welcome to Online Clothing Study. Read this page before you explore this site and to know what you can get here. It would be difficult for me to explain to you in one page what all you can get here. Instead, I will guide you how to find articles in this site that you need to start with. If you want to improve your skill by learning and want to explore your knowledge in garment manufacturing, you are in the right place. I have published so many tutorials here, you can learn lot things here. Start learning online with your regular jobs. I have covered most of the areas about garment manufacturing industry. I have made archive pages for a few important fields. You can directly link to those list from here. After reaching to the archive pages, you can search article titles for the lists. In case, you are interested to learn Industrial Engineering, download the eBook "Industrial Engineering 101". 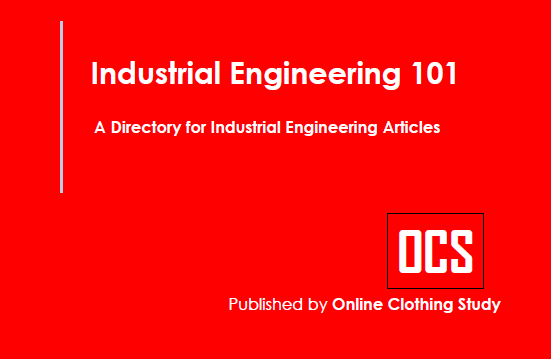 This is a directory of all published articles under Industrial Engineering label. By downloading this eBook you can checklist of published articles from your computer. Full articles are one click away. Click on the below book cover to download. Use menus to find articles related to your interest. To find the article that you need to read and download use search box on the top-right corner. To receive our latest updates subscribe free tutorial by email. I will never spam you. Subscribe our Free tutorials by entering your E-mail id and activate subscription by clicking on the link you receive in your mailbox. Looking for guides, tutorial in apparel manufacturing? Explore online clothing study tutorials. OCS is the one stop platform for apparel production learners.